Hi everyone, can I pick your brains please? Picked up my first Dobro today a 1973 114 omi in very nice condition. Something called a micro tilt adjustment was mentioned, I wondered if the two screws/nut pictured here are the means of making adjustments. If you could let me know their purpose please I could maybe make use of them. I'm happy with the set-up at the moment, but when I change the strings (MM newtones of course) I'd like to adjust things to my own specs. Any other advice or tips would also be welcome of course. They talk about it here, but no definitive yes or no, when you re string take it apart and see what's going on inside. The Dopyera brothers, especially Ed & Rudy, sometimes worked in clever, innovative, but mysterious ways and this is a strange one. 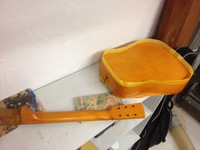 This model with its square shoulders was designed to be for the folk market to be strummed as a regular guitar, not to be played lap style as a steel guitar. It is no different in structure to other OMI Dobros, but the shape is different. Because of the shape being less desirable than standard Dobro shaped guitars, these guitars have stayed under the radar and are rarely seen. That is not a negative comment, just an observation. It is certainly quite a rarity. I think Ronnie Lane had one of these. Until I know for certain I cannot give you any instructions about adjusting the neck angle because I am not sure that is what it actually is. You can adjust the tension screw in the spider, but only if the sound is either choked or is rattling. This screw tightens the spider onto the cone and creates the tone. Too tight and you can wreck the cone, too loose and it buzzes/rattles. There is a sweet spot where everything feels and sounds perfect. That can only be done by ear and feel. 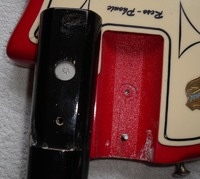 If you do adjust that screw, my advice is to turn it in half turns with the strings in tune, and write down every half turn you make in any direction, that way you can read your road map and return it to where it was if necessary. I would like to see the guitar to be sure of what I am saying. Meanwhile I'll ask Mike Lewis and Dave King if they have ever worked on one. Thanks Lee, good place to start. 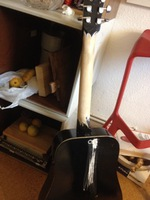 Model #114 seems to be mentioned also that it's quite an unusual guitar. I'll post more pics. Thanks Michael,we were posting at the same time! 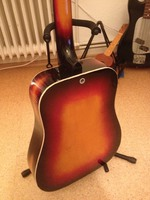 The guitar is very well made,not at all a homemade affair as suggested on the forum Lee refered me to. Definitely more research to do! Apart from all that, it's a lovely feeling and sounding guitar. John, what made the previous owner think this is a model D60 from 1970? I am not sure that is the correct model name or year. It is a very rare instrument and as I said earlier, I can only recall seeing one other. 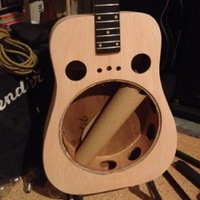 This is not the instrument I thought you were talking about and it is not the model that Ronnie Lane had. There is definitely some old Mostrite Dopyera jiggery pokery going on here, but I can't say any more about it until I have researched further. Morning Michael et al, went to the bible and there she is on page 261! The chap I got it from wasn't particularly knowledgeable about this guitar and I didn't get it because it was a particular model. 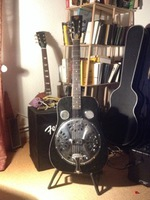 I got it because it's a nice guitar, I wanted a Dobro and we made a deal that suited us both. So as far as I can tell it's a model 114 made in 1973. 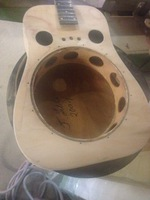 With this information I may be able to track down some information on how to adjust the neck should I need to. The adjustment features are mentioned as a selling point in the ad I posted earlier. All advice welcome! Me again! Further reading would suggest it's a 114a model, it does have a properly (factory) installed pick-up. Phew... I am not trying to appear clever, but that is exactly what I thought it was. A 1973 model #114. A model D60, or 60D, is a whole other thing completely. 2 years ago i got an omi dobro from the bay. it was sold titled 'dust catcher' and it was all painted black. it's clearly a 114 made for slide players with the neck entering the dreadnought- body at the 14th fret. the serials are found more or less easily in the www. 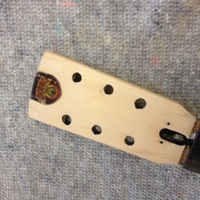 the neck is adjusted by the screw from the top. 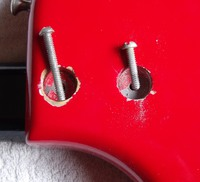 you loose the strings , loose the neck bolt from behind (allen wrech). you adjust the neck position and do things in reverse order. Welcome to the forum mm, lower case I notice! 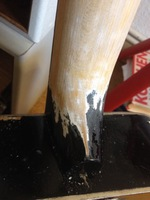 Did you strip it apart and refinish it? Nice job. 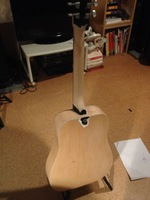 Don't think I could have found out how to adjust the neck unless I had taken the guitar apart as you have done. Do the two screws (front and back) counterbalance each other? At the moment I'm okay with the set-up 3mm at the 12th fret, but it's always good to know how to do things if required. Thanks for posting, nice guitar isn't it. Hello mm, Welcome to our forum. There are now three of us on here; Mark Makin, mm, and me. I am pleased that you have found us, joined and contributed your photos and experience to this thread. They are very small files so it is not easy to see any detail. Is it possible to post larger files, especially if you can show the neck adjustment? Is it okay for me to call you millimetres?